Merry Pawsmas! Sitting at the kids’ table is usually a lot more fun, but when the kids’ table is full of canine friends, it’s not just fun, it’s awesome! This year for Christmas dinner Versailles, KY-based couple Kelly and Zach Furr decided to make their holiday meal even more festive and entertaining by setting up a kids’ table for their dog and his friends. Each pupper was dressed in a Christmas sweater and served with a big rawhide bone on their plate. Our favorite detail from this fantastic photo is the teeny-tiny chihuahua who’s so small he/she is sitting on a booster seat. We hope each of these adorable and impressively well behaved doggos found a World’s Best Dog Trophy in their Christmas stockings. 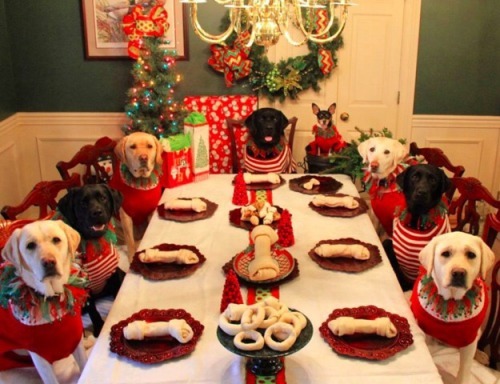 Visit BuzzFeed for more festive photos of the Furrs and their canine friends.